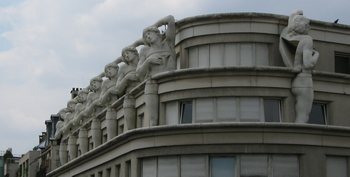 Statues of men with triangular holes through their torsos decorate the top of a building that now houses a police station near the Gare de Lyon. I thought these photos would go well with the testosterone story. One of the things I love about Paris is that it is difficult to get truly lost. Street signs like these are on almost every corner. 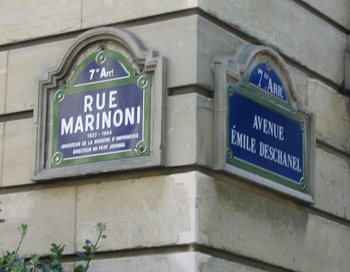 They tell you not only the street names, but what arrondissement you are in. They often even give you a bit of history about the person the street is named for. This one is named for Hyppolyte Marinoni (1823-1904), constructeur mécanicien. By the way, you can find out almost everything about every Paris street on a web site run by the city of Paris. 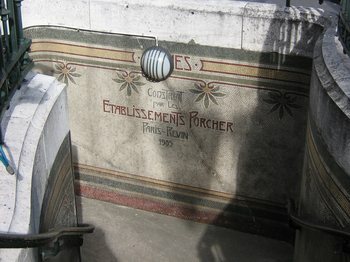 One of Mary’s guide books said not to miss these art nouveau public toilets under the Place de la Madeleine. We found them, but it was the day of the World Cup final and the staff evidently went home early, locking us out. Above is the entrance. 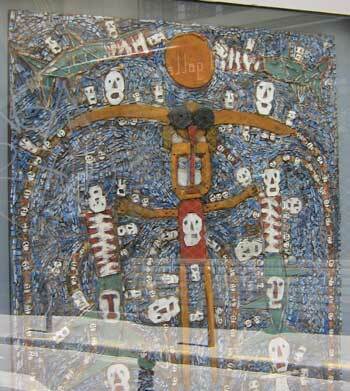 Interesting Day of the Dead artwork in a shop window, I think in the Marais. I really don’t remember where now! The heat wave is mercifully over. Surely by now you have heard about the fact that the Tour de France winner, Floyd Landis (American, with the Phonak Hearing Systems team) has tested positive for too much testosterone and may be stripped of his title as winner. Here’s an article from the International Herald Tribune about the case, and his denials. The overwhelming majority of research conducted in the past 25 years in both animals and humans has found that alcohol inhibits testosterone secretion. However, a new study in the January issue of Alcoholism: Clinical & Experimental Research has found that acute administration of alcohol can induce a rapid increase in plasma and brain concentrations of testosterone in some rodents. My cynical husband said, “Oh so that’s how he plans to defend himself,” implying that the story about drinking the night before was fiction. However, the a newspaper evidently carried a story about Landis and four or five other riders drinking that evening and the story was published before ANYBODY knew anything about the doping test results, which were released just a few days ago. How much did he drink? The French newspaper Le Parisien says that the Wall Street Journal reported “less than four glasses.” However, Le Parisien quotes Landis as saying that the Phonak team was very depressed the evening after Landis’s failure in the 16th stage, so they went to drink beer at a bar next to the hotel. When everyone started to come into the bar, they went back to the hotel where four or five of the team members – including Landis - consumed a bottle of whiskey. There may not be a decision in this case for months, so don’t hold your breath. There was an article in the International Herald Tribune on Friday about “France’s mysterious embrace of blogs.” Some of you may have read it because IHT articles are often published in the New York Times. Since I am blogging in France and since I have been doing this blog since before the word “blog” was even invented, I must comment. Supposedly, the French blog and read blogs more than Germans, Britons and even Americans. The author of the article, Thomas Crampton, attempts to explain why. I doubt that will be the reason that people don’t protest if indeed they don’t. In fact, later in the article it is said that bloggers have been arrested for coordinating last Fall’s riots in their blogs. According to a French-born, New Yorker who works for a company that monitors blogs, French blogs are “longer, more critical, more negative, more egocentric and more provocative than their US counterparts.” Now, THAT I can believe. Complaining is an art-form here in France. Egocentric? Maybe. I’ll have to investigate that assertion a bit more. Provocative? Yes, indeed. The French are more provocative about many things, including sportswriting. Why not blogs? I think that it is true that there are many French internet users, because high-speed internet service is so inexpensive here. I also think the French read more than those in other Western countries. Evidence of that is the very big fuss that is made about all the new books that come out every Fall, and how very many books are bought here. And look at all the newspaper kiosques and newstands all over Paris! The pioneer French blogger also said “It is clear that in France we have very large egos and love to speak about ourselves.” Hmmm. Only a Frenchman could get away with saying that. Those of you who read my journal faithfully know that I reveal surprisingly little about myself and my family. One reader, Cynthia, had to ask me who Dan and Mary are. They are family, and that’s all I say. I also never reveal the address where we stay. One reader, Alan, figured out approximately where we are because he lives nearby and he had seen the firetrucks that I photographed one day when a fire broke out in an apartment across the way. Notice that I only give first names for all the people I just mentioned? I do comment on French culture, news, attitudes, etc. When I talk about us, it is generally just to say where we walked, what we saw, where we ate, what happened to us, and what it was like. A final assertion in the article is that the French blog because they all want to be in charge. That’s why there are always so many French candidates for President. If there is one thing I never, ever want to be, it is President of any country.